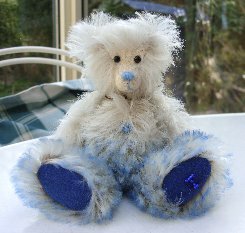 Let us introduce you to Jefferson Braces, a handsome 5 1/2" bear made of silky soft, off white German mohair with quite a long, wavy pile. We have combined this for his trousers with dark brown backed cream Hembold mohair which is tipped in pale blue. Whilst it may sound like these colours won't work, this fur is gorgeous! It is silky soft with a lovely sheen to the pile and looks great with the off-white mohair of his top half. We have given Jefferson Braces dark blue ultrasuede pads, cream ultrasuede paws, a light blue stitched nose and shiny black German glass eyes. He has dark blue ribbon braces and is steel shot and steel ball filled for weight. I hope you like him, I think he is gorgeous, with a lovely little face. He costs £45 plus postage. Please note that as with all our bears, Jefferson Braces is not a toy and is not suitable for children. Sorry - Jefferson Braces has been adopted.